The China-India media forum was launched in New Delhi on Monday in the presence of Chinese Minister of State Council Information Office Cai Mingzhao and Indian External Affairs Minister Salman Khurshid. Khurshid has urged media personnel from both sides to look at reporting which allows trans-national or national interests to “prevail over the desire to report aggressively” in the face of the historical border dispute that stems out of an undefined border. 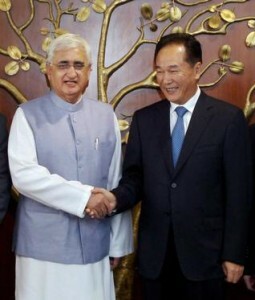 Khurshid said both sides are keen on removing this “irritant” from Sino-Indian ties. “It is a fact that we have an undefined boundary and therefore differences in perception… But in our hearts, we know that it is not an insurmountable problem but also that both of us are committed for eradication and removal of these irritants in our relationship,” Khurshid said during the launch. Chinese news organisations have been critical of Indian media’s “sensational reporting” on the border issue which they have said is “harmful to the China-India relationship”. China’s Minister of State Council Information office, Mingzhao pointed out that only a mere 20 journalists from India and China report from each others’ territories and this was not enough to reflect the developments between the two countries whose strategic partnership is growing. “I hope that they could gradually station more reporters in each other’s country, or send more reporters to each others’ countries to conduct interviews, meet local residents, and gather real, fresh and first-hand information,” he said. “For some reasons, Chinese and Indian media still do not have sufficient understanding of each other’s country, still cannot fully reflect the current status of the friendly bilateral relations, and still cannot meet the two peoples’ demand for information about the other country,” he said. “Will we see ourselves as rivals and competitors or will we see ourselves in multi-dimensional roles with each other collaborating, cooperating, competing, assisting, sharing and more importantly, if I can add an important word, ‘caring’ for each other,” he said. “We hope this interaction (Media Forum) will help in constructive reporting and analysis methodology and understanding of each others’ working systems,” he said. On social media, Khurshid said India hoped to learn from Chinese experiences with it.